Increased awareness about healthy food and a desire to engage with nature, even within the city encourage more and more people to grow their own food. But how to start? This course will enable students to start their own vegetable garden on their balcony, rooftop or backyard. Students will get hands on knowledge, tips and tricks for growing vegetables in on the balcony or rooftop. Besides of the practical experience, we will also reflect on the effects of gardening on body, mind and soul, the history of food production in the city and the roots of the growing urban gardening movement as well as recent developments such as high-tech gardening and urban homesteading. We will also explore the history of gardens in Egypt and visit Al-Ahzar park as a modern garden with many historic elements and as well as edible landscapes and explore foraging in the city. The course will be approximately 50% practice, and 25% theoretical gardening knowledge and 25% reflection. make a potting mix, raise seedlings, propagate plants from cuttings, learn about chemical free fertilization and pest control. Expect practical and localized information on growing vegetables in hot climates in the city. We will focus on soil based systems, therefore hydroponics and aquaponics will be considered as options for urban food production, but we will not go into the technicalities of these systems. We will also focus on urban gardening, which means small-scale, decentralised, low-tech, community based, non-profit food production in contrast to large scale, high-tech, controlled environment, for-profit growing systems. Gardening is dirty business and that’s why it’s fun! Students are recommended to bring an extra set of gardening cloths (old pant and shirt) that can get dirty. All work will be carried out directly by hand, without shovels or similar. If you wish to use a shovel or gloves, please bring your own. Besides the course fee, participants are requested to pay a 200 EGP cost contribution. de la Salle, J., Holland, M. et al. 2010. Introduction. In: Agricultural Urbanism: Handbook for Building Sustainable Food and Agriculture Systems in 21st Century Cities. place n.a. : Green Frigate Books, pp. 11-38. Since putting a seed in the soil is a powerful image of creation and resurrection, we will explore this simple but fundamental act from a philosophical perspective. We will check on the seedlings, which most likely still need some time to grow up. We will use the time to make planters from recycled wood, plastic bottles and other materials. We will also prepare our compost bins for aerobic and anaerobic digestion of our garden and kitchen waste. We will reflect on waste, reusing, repurposing and recycling. The seedlings should be big enough by now and we will plant them in the pots and containers, that we prepared the week before. Since now we got our hands dirty a couple of times already, we will reflect what the interaction with soil, seeds, compost and plants feels, and what it does with us. (Outdoor session in Al Azhar Park). Al Azhar Park incorporates an intriguing variety of edible plants, herbs, and fruit trees. The landscape designers of the park purposefully included these in the park with the objective that visitors and Darb El-Ahmar residents can forage from the plants of the park. We will explore the landscape of the park, idenify edible plants in the park, collect seeds and take cuttings for propagation. We will also look at the concept of urban foraging and map, where else in Cairo edible plants have been adopted in landscaping. - El-Masry, L. and Stino, M., 2011. The design of Parks and Gardens in Cairo, Egypt: Their Heritage, Tradition and Development. - Aga Khan Trust for Culture, 2005. Al-Azhar Park, Cairo and the Revitalisation of Darb Al-Ahmar: Project Brief. Week 6 - Tending the garden I: mulching, weeding, pruning, etc. We will tend the garden and do all necessary work. Work or recreation? Chore or passion? We’ll reflect on the experience of gardening and its impacts on body and soul. We will discover, how technology is increasingyl applied in gardening and agriculture through sensors, robots, drones, etc. We will test two different systems of sensors for plant control (Flower Power from Parrot and a self-made Arduino based kit). We will explore if all this actually makes us smarter or leaves us more ignorant. We will talk about the dichotonomy of tech and tradition in gardening and agriculture and explore if and how the two can be reconciled. 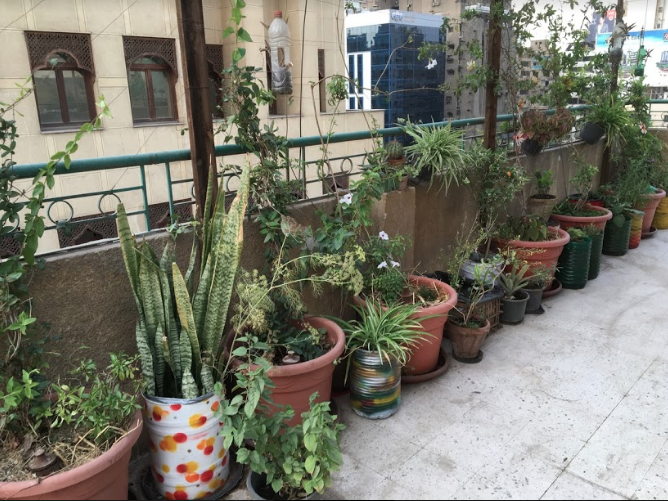 We will learn the history of urban homesteading in Cairo and explore how contemporary homesteading in Cairo can look like. We will therefore discuss local, community based models and explore, how we can form local food communities. We will tend our garden and test some methods for home steading, like drying fruit and vegetables, making jam, pickles, pasta, etc. We will celebrate with a meal (breakfast/ dinner, depending on the day time) with fresh produce from our garden, reflect on our gardening journey and share our experiences. Bianca is a German gardening and food enthusiast. She comes from a family with a long history in agriculture and horticulture and grew up between vegetable fields. In Egypt she lived 4 years at the Sekem farm, where she learned about organic agriculture and the specific growing conditions in Egypt. Now she experiments on her own 100 sqm rooftop in Mohandessin and coordinates the Slow Food 10,000 Gardens in Africa project in Egypt that supports schools and communities to create food gardens. Bianca has a master degree in Green Economy from Bournemouth University and completed her BA in Philosophy and Economics at Bayreuth University. She is also a Lead Planner of Social Component: Quality Education Support Program I & II (QESP I & II) at GOPA Worldwide Consultants. Bianca’s purpose is to reconnect people in the city to nature by educating them about environment, gardening and healthy food and promoting sustainable urban gardening. بيانكا هي ناشطة في مجال البستنة والغذاء. تنحدر أصولها من عائلة لها تاريخ طويل في الزراعة والبستنة ونشأت بين الحقول الخضراء. عاشت في مصر أربع سنوات في مزارع سيكم حيث تعلمت الكثير عن الزراعة العضوية في مصر، وتجرب اﻵن الزراعة فوق سطح بيتها على مساحة 100 متر مربع في المهندسين وتنسق الدور المصري في مشروع "ألف بستان في أفريقيا" ضمن حركة الطعام البطيء (سلو فود) التي تدعم بساتين الطعام في المدارس والمجتمعات. تحمل بيانكا شهادة الماجستير في اﻹقتصاد اﻷخضر من جامعة برونماوث وحصلت على شهادة الليسانس في الفلسفة واﻹقتصاد من جامعة بايرويت. تهدف بيانكا إلى إعادة وصل الناس في المدينة بالطبيعة عن طريق تعليمهم أشياء عن البيئة والبستنة والغذاء الصحي ونشر البستنة الحضرية المستدامة. تعمل بيانكا اﻵن في سيلاس بصفتها الزميل اﻷكاديمي المقيم لحقل العلوم الطبيعية في سيلاس.